Virtual surround-sound speaker systems incorporate multiple speaker drivers and fancy electronics in a single speaker unit. Virtual surround sound systems should be placed in the front of the room (usually right above or below your display). These virtual systems use a combination of physical “aiming” and electronic trickery to introduce timing delays in the sound coming out of the speakers’ drivers, which makes the sound “bounce” off your walls in a coordinated fashion. The result — while typically not as immersive as a full set of surround speakers — can come a lot closer to real surround sound than a pair of stereo speakers. The technology that drives many of these systems comes from the folks at Dolby Labs. Dolby Virtual Speaker is Dolby’s system for providing a 5.1-channel experience from two or three speakers. A great example of a speaker system using Dolby Virtual Speaker is the Klipsch CS-500 2.1 Home Theater with DVD. 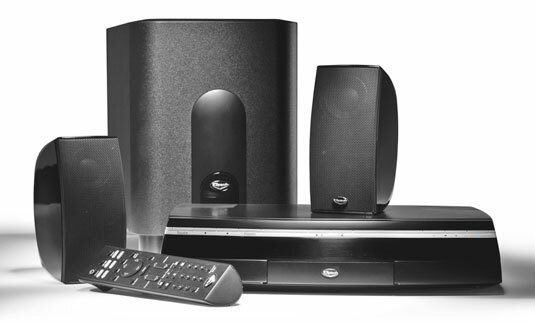 This system includes a 2.1-channel speaker system (two satellites mounted in the front of your room plus a subwoofer, along with a main unit that acts as a home theater receiver and a DVD player. Install virtual surround sound, like this Klipsch CS-500 system, if you’re short on space. You can also find speakers known as soundbars. These are wide (but short), wall-mounted speakers designed to be mounted underneath a flat-panel TV. Soundbars (such as Yamaha’s YSP-1100 digital sound projector) have multiple speaker drivers built into a single cabinet and typically include built-in amplification (that is, they are active speakers). A soundbar isn’t always the cheapest option, but it is an elegant one if you want to minimize your installation work.